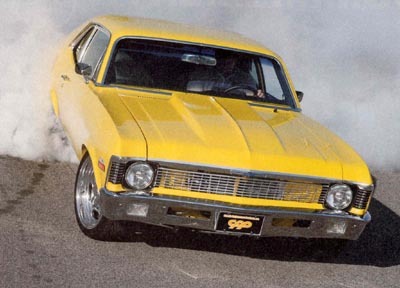 The last few issues of SUPER CHEVY have followed the build and performance of this Yellow '70 Nova owned by Jim Ries of Classic Performance Parts (CPP). His Nova received new underpinnings from TCI, and part of those underpinnings included a new set of Wilwood brakes. We then tested the Nova in Fontana at the California Speedway. When it came to the braking aspect of the tests, this little Nova stopped the shortest distance of all the cars we've previously tested. That got us to thinking about brakes and brake systerms. Does this Nova have some secret weapon that the rest of us are unaware of ? Not likely. The truth is there are several different answers to this question, from the master cylinder, to power assist Hydraulic Brake Assist System to fluid, to calipers, to rotors, to tires, to vehicle weight, and even to wheel size. 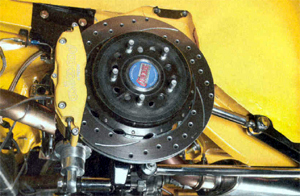 In a quest to dissect the Nova's braking system and check on its performance, it became necessary to go back to Braking 101 and explore the anatomy of the more common brake systems in use today by most Bow Tie enthusiasts. Brake systems convert kinetic energy or the vehicle's movement into thermal energy or heat. Thermal energy is a direct result of the friction from pad to rotor. The more thermal energy created and dissipated from the braking system, the faster the vehicle slows down. More on this later first, let's take a look at the particular hardware installed on this '70 Nova and then dive deeper into brake systems and their technology. Now that we know what's in the Nova, we can breathe easy for a few minutes and look at the history of braking and all the individual components that make up a vehicle's brake system. Since the first production vehicles in the 1800s, automobiles have always had the need for brakes. Horsepower alone means nothing if one can't stop the horses. Even the earliest vehicles employed one type of braking system or another, and these were all mechanical brakes. It wasn't until 1918 that hydraulic brakes were introduced to the automotive buyer. 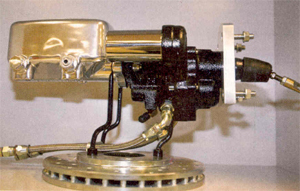 Those first hydraulic or "juice brakes" were available on the 1918 Duesenberg. After 1918, most of the higher-end production vehicles were equipped with hydraulic braking systems. In the 1930s, juice brakes became commonplace on lower priced production vehicles, though Ford stuck with mechanical brakes long after others because Henry was afraid of hydraulic systems. Nearly all vehicles at the time were using drums for their braking systems. It wasn't until the 1950s, when Chrysler introduced disc brakes to its production vehicles, that disc brakes became an option. Interestingly enough, in the early 1960s Studebaker perfected the use of power boosted disc brakes, and from there it caught on until nearly every automaker offered them as standard or option- al equipment. The Corvette broke new ground for an American car company in 1965 with four-wheel disc brakes became standard equipment (manual, with power assist optional). With the modern technology available, the average musclecar enthusiast can easily build a streetable 600 (or more) horsepower engine. 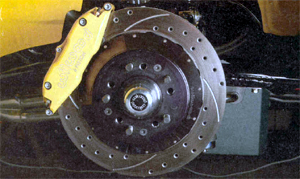 Just as engine building technology has progressed, so has brake technology. While the initial designs and theories have remained mostly the same, the materials and their applications have catapulted forward as well. The purpose of this article is to focus mainly on disc brakes from GM OEM styles to performance upgrades such as we see on this Nova. Due to the amount of information we have thus far collected, we will have to break the story in half for lack of space. Brake fluid is the unsung hero of our systems. Brake fluid is just about as entertaining and exciting as valvestems, yet without it we would need to have Hercules sized legs in order to stop our cars. Brake fluid's primary job is to transmit force from the master cylinder to the calipers, and it does so under some intense pressures and temperatures. This fluid is important enough that the government has regulated and set a minimal standard with 14 properties that are required of every fluid on the market. If the fluid fails to meet even one of the 14 set standards, it will not receive a government DOT rating and cannot be sold as brake fluid. The Department of Transportation National Highway Safety Administration in Federal Motor Vehicle Safety Standard 116 (FMVSS116) has classified brake fluids into three categories: DOT 3, DOT 4, DOT 5, and now DOT 5.1. If water boils at 212 degrees Fahrenheit and freezes at 32 degrees, brake fluid must function below and above any of the temperatures that will freeze or boil water. In other words, brake fluid must remain viscous and resistant to severe conditions. It must also absorb water without having an affinity for doing so. Its boiling point and chemical properties must remain stable. That's a lot to ask of a fluid, isn't it? It seems logical that if DOT 3 is good enough, then DOT 4 must be better. And if DOT 4 is better, then DOT 5 and 5.1 must be better still. OK then, why? It all boils down to boiling point. When brake fluid begins to boil (from the heat that's generated in the system during braking), it forms gas bubbles. As these bubbles collect and grow, they form pockets of gas in the brake lines. And since gas compresses much easier than fluid, these gas pockets cause the pedal to compress or become spongy. (This usually occurs during lots of hard braking, such as coming down a mountain or on a road course.) This is what is known as brake fade. Each respective class of fluid must meet a minimal wet and dry boiling point. The term "wet" brake fluid means it's saturated with water, while "dry" brake fluid means it's still pure and has no water absorption yet. By the very nature and chemical makeup of brake fluid, it will absorb water no . matter what climate it's in. The different DOT spec fluids have chemical or formulation differences, as well as boiling point differences. There are (at this point) three commercial formulations for brake fluids; two are glycol based, and the third is silicone-based. Silicone based fluids absorb no water and should never be mixed with glycol ether based fluids. DOT 3 brake fluids are a mixture of polyalkylene glycol ether and other glycols (all start life as ethylene glycol antifreeze); DOT 4 fluids add borate esters to raise the boiling point. DOT 5 is silicone oil based with additives. DOT 5.1 fluids have essentially the same chemical makeup as DOT 4, only they have as high a boiling point as DOT 5, which is silicone based. DOT 3, 4, and 5.1 can be safely mixed and used together because they're made of the same compounds, while a DOT 5 mixture should never be mixed with the others due to its silicone makeup. When was the last time you remember changing the brake fluid in your vehicle? The average enthusiast should change his fluid every 1-2 years just to keep the boiling point up. Grabbing power in the front of this Nova is performed by fixed Wilwood six-piston calipers with Wilwood brake pads and 13-inch two-piece rotors. The rear of the vehicle is equipped with fixed Wilwood four-piston calipers and 13-inch rotors as well. Power from the pedal to the calipers is done with CPP's rather new production MCPV1 Hydraulic Brake Assist System master cylinder. We'll take a deeper look at this later. Here is another shot of the CPP Hydraulic Brake Assist System taken in its showroom. What's unique about it is the location of the hydraulic unit. 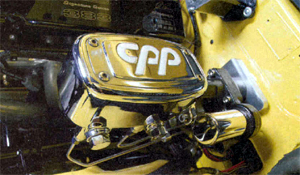 Instead of being located on the right side, where it could interfere with the valve covers, it's located on the left side. This leaves room for taller valve covers. Every vehicle owner wants brake pads that are quiet yet grab like an eagle's talon and leave very low dust. Good luck on that, as with all things automotive there is a compromise. Brake pads are the sacrificial lamb in the brake system. They will all wear down and reach the point of no return and eventually need replacing. Brake pads are like Coke and Pepsi, Both have similar ingredients, yet each company mixes their various ingredients differently, and each company has their secret mix that the other guy may not have. Yet both can be classified as a cola. Just like Coke or Pepsi, each brake pad manufacturer keeps their specific pad compound a secret. Surprisingly, the government regulations and definitions that apply to brake fluids and their chemical makeup don't apply to brake pad manufacturers. Nearly all brake pads contain similar types of etc. Brake pad compounds can be a very deep and broad subject. Rather: than speculate about the chemical makeup of brake pads and their performance, we went straight to the source and asked the professionals at Hawk Performance to define and explain the difference in pads in layman's terms. Organic brake pads are defined as friction materials with less than 20 percent metallic content. Historically, most organic brake pads contained asbestos, which is now classifisd as a hazardous material. Today, the organic pads used in the United States are identified as NAOs (Non-Asbestos Organics). definition is so broad, some companies have adopted the terms "low met" and "high met" to indicate at what end of the spectrum their product could be categorized. Semi-metallic friction materials are the most widely used technology for automotive disc brake pads. GOOD ROTOR WEAR BUT SLIGHTLY GREATER THAN NAOS WHAT ARE CERAMIC PADS? WHY THE BUZZ OVER CERAMIC? Contrary to popular belief and current marketing strategies, ceramic brake pads and rotors are not available in the general automotive market. A true ceramic brake pad is just that, a ceramic composite material that is designed to run against itself. The latest market trend toward ceramic brake pad technology is 90 percent marketing and 10 percent fact, according to Hawk. The reaity is that the market defines ceramic brake pads as friction material with more than 1 percent ceramic content. Considering that ceramic materials have been used in organic, NAO, and semi-metallic formulations for decades, the marketers simply repacked and relabeled existing technology. It should be noted that several friction manufacturers have developed NAO and semi-met formulations with a higher than normal concentration of ceramic materials. Typically the ceramic element still remains under 15 percent of the overall friction formulation content. What is important to understand is the marketing promise of a "ceramic" brake pad and fulfilling that promise with a NAO or semi-met product that has a minimum of 1 percent ceramic content. Note: The ceramic brake promise takes the best features of both the semi-met and NAO characteristics and rolls it into one product technology. This is not by accident. WHAT TYPE OF BRAKE PAD WOULD HAWK RECOMMEND TO THE AVERAGE ENTHUSIAST WHO PLANS ON HIS CAR BEING STREET DRIVEN ONLY? Performance Ceramic for select domestic and European import cars and trucks. Yes, all three products have 1 percent or more ceramic content. What's more important is that they all deliver the performance characteristics promised. WHAT TYPE OF PAD FOR THE GUY WHO DRIVES HIS VEHICLE ON THE STREET THEN MIGHT TAKE IT FOR AN OCCASIONAL AUTOCROSS OR DRAG RACE? Use race pads for the track and street pads for street. Some companies offer autocross products that are safe to use when driving from home to the track and back. It is still strongly recommend that consumers change back to street pads after any race event. Some pads need a lot of heat in them to work properly and are not suitable for the street.